There are a fair few reasons why the Scandinavian might serve you well as a defence to 1.e4. First off, it is an opening that players on the White side might be inclined to underrate, not least because it breaks a cardinal rule drummed into us all as beginners: do not develop the queen at an early stage of the game (1.e4 d5 2.exd5 Qxd5). White players may take the tack that simply by playing sensible developing moves they will obtain an advantage. Secondly, theoretical knowledge develops slowly in the Scandinavian and, while there are certainly some critical lines, it is a low-maintenance defence. There are not many such defences around, frankly, so when you find one, cherish it. Third, Black can create the pawn structure he wants (essentially W: d4 versus B: c6 and e6) virtually by force. Larsen somewhere characterised the Scandinavian as an improved form of the Caro-Kann, and so in a sense it is. Certainly, it is more straightforward to play. Black doesn’t have to contend with interlocking pawn chains or isolated queen’s pawn positions, as he does when playing the Caro-Kann (think of the Advance Variation, the Panov-Botvinnik Attack). At move three (following the usual sequence 1.e4 d5 2.exd5 Qxd5 3.Nc3), Christian Bauer recommends the once standard 3…Qa5 rather than Titiakov’s new-fangled (once, at any roads, it is now quite common) 3…Qd6 (which offers ‘only distant chances to equalise’ according to Bauer) or 3…Qd8, a move essayed by the current world champion. He presents the detailed theoretical material in the form of 30 or so video tutorials, with a further 13 videos being used to test tactical skills and understanding of Scandinavian structures. 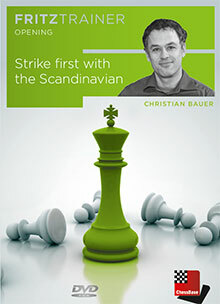 There are also two accompanying databases: one is a summary of the analysis in the videos, consisting of key games and lines, the other is a collection of 78 instructive Scandinavian games, about 30 of which are annotated by Bauer. In the ‘Analysis’ database I had some difficulty locating Bauer’s fine victory over Zinchenko (played at Metz, 2010), given in video 12, but found it eventually (the complete game) in the annotations to the main game Pavasovic-Bauer. Apparently, games given in the annotations are not searchable in the database (Pavasovic delivers a search result, Zinchenko does not). The mainline pawn sacrifice of 10.Qe2!? Bxc2 is worth exploring (this following 1.e4 d5 2.exd5 Qxd5 3.Nc3 Qa5 4.d4 Nf6 5 5.Nf3 c6 6.Bc4 Bf5 7.Bd2 e6 8.Nd5 Qd8 9.Nxf6+ gxf6), when the most accurate continuation is 11.0-0 Bg6 12.Rfe1… with decent compensation. An interesting positional sideline involves fianchettoing the king’s bishop and then, after the …Bc8 develops, hitting the Queen with b4 and following up with a later b4-b5 to try to pry open the long diagonal. Look, for example, at this game: 1.e4 d5 2.exd5 Qxd5 3.Nc3 Qa5 4.Nf3 Nf6 5.g3 c6 6.Bg2 Bf5 7.b4!? Qc7 (7…Qxb4 8.Rb1) 8. 0-0 e6 9.Rb1 Be7 10.b5, etc. (Shabalov-Minasian, New York 1998). Finally, there is 3.Nf3, a move that is still relatively unexplored. This reserves the option of kicking the Queen with c4 rather than Nc3 (there is a view that the knight is misplaced on c3, sitting as does in front of the c-pawn). And a tricky line is 1.e4 d5 2.exd5 Qxd5 3.Nf3 Nc6 4.Nc3 (notwithstanding the previous comment) Qa5 5.Bb5 when White’s active pieces crowd around the …Qa5 and Ne5-c4 might easily become a threat. This is an enjoyable and useful DVD by the experienced French grandmaster. His calm and considered presentation effectively communicates the sometimes intricate theory of the Scandinavian, an opening that he clearly knows inside and out. Both methodical and perspicacious throughout, he will undoubtedly give Black players a thorough grounding in the 3…Qa5 Scandinavian. Furthermore, 1.e4 players should be able to glean several ways by which they can fight for an advantage. The publisher’s description of Strike first with the Scandinavian is here.